Another Day, Another Massacre | HAIL DUBYUS! (WashPost) Bush vows punishment if laws broken in Haditha… Isn’t that what Bush said about the Valerie Plame leak? (WashPost) U.S. 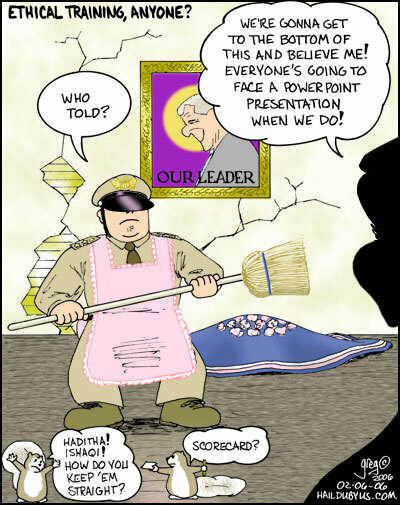 Troops in Iraq to Get Ethics Training…you WILL watch this PowerPoint presentation! What can we say? Our soldiers are in a tough situation. They’re being expected to be peacekeepers in an environment that is totally alien to them, where they cannot tell the “good guys” from the “bad guys.” They can’t be trained for it, as the Pentagon is trying to push, because there’s no way you can train a soldier in a few short weeks about something that even our experts are having a hard time doing. Eventually, our boys get into a situation where their buddies have been killed in front of their faces and they lose it. It’s what happened in Nam and it’s what’s happening in Iraq. Yes, the soldiers have a responsibility for their own actions. But even greater responsibility lies on the men who put them into an impossible situation to start with, the bastards that started a war of aggression against a country that was slowly starving to death, caught between the rock of economic sanctions and the hard place of the dictator against whom the sanctions were levied. Started a war of aggression with sufficient troops to capture Baghdad, but insufficient troops to hold the country together afterwards. Boiled the blood of the soldiers with hatred by mendaciously implying that the country they were fighting was behind a terrible catastrophe that was a wound in American souls. Looted the country of its oil wealth and treated it as a feeding trough to glut the rapacity of war profiteers. In Viet Nam we had My Lai. Here we have Bush’s Lie.